This is an excellent winter vegetable to have with casserole of pheasant. Chop cabbage into 1/4s remove stalk and slice the apples and onions. Put a layer of cabbage in the saucepan followed by a layer of onions, apples, brown sugar and seasoning. Repeat until you have used up all the vegetables. Pour over the wine vinegar. Cook on a low heat and stir frequently. 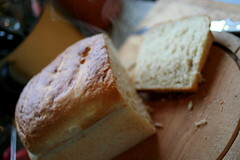 I always make my own bread but one of my contacts on Flickr-Falling Sky- posted his results of using a recipe from the Guardian. I tried it out and was impressed by the taste and airy nature of the final loaf. It uses the sponge method of soaking half the flour in the water and yeast for several hours. By a strange coincidence there was a TV programme on just this topic last night- The Hairy Bakers. I have adapted my own recipe to make a batch of 3 loaves using the Kenwood mixer with dough hook. 1 1/2 Ibs of strong white flour. 2-3 level teaspoons of dried yeast. Put the water in the large mixing bowl and add the yeast. Add the flour and give it a quick blitz with the dough hook to stir it up. Leave for several hours with a tea towel over the top. This is the sponge and it will rise up as the yeast gets to work. 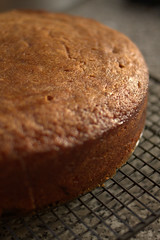 When ready, rub the butter into the second half of the flour – I like some wholemeal mixed in but you can use all white. Mix into the sponge and it may be necessary to add a little more water to create a sticky mix. Leave again and give it a quick knead with the dough hook 30 minutes later. Leave for another 30 minutes and then take out and knead on a surface until its nice and smooth. Don’t add too much flour to stop it sticking. You can oil the board if you want. Then shape and put in to the bread tins. Leave again until they have doubled in size in the tins. Brush the tops with milk and sprinkle with sesame seeds. Bake in a hot oven – 200C in my fan assisted oven for 30 minutes does the trick. Tap the bottoms and they should sound hollow. It is a shame that redcurrants and blackcurrants come to fruition at the same time! This weekend has been a frantic cooking time. 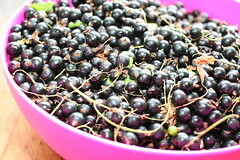 The blackcurrants are difficult to pick. They hide away beneath the leaves but we got two huge bowls full. There are various methods for making sorbet but this is mine. I wash the berries first. 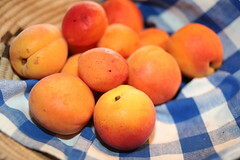 To release the juices, I put them – berries and stalks in the preserving pan with a little water and heat. This helps get some of the juices going but there is nothing for it. You have to put the lot through the sieve and mash the juices out. This is hard work and you have to be careful otherwise the kitchen looks like a chain-saw masacre. The juices can get everywhere! Just do a little at a time. I make up a syrup with 1 pint of water and 12 oz castor sugar, add the lemon juice and zest and boil for a few minutes. Cool. Mix the blackcurrant juice and syrup. I use half and half and then taste. It is a fine balance between having the sorbet too tart or too sugary. Put in the fridge to cool and then pour into the ice -cream maker for about 15 minutes until slushy. If you haven’t got an ice-cream maker then put in a container into the freezer and stir the mixture up every 1/2 hour or so to stop ice crystals forming. The effort is worth it. This is one of the best sorbets with an intense flavour.